As I’m off to the Somme to make a documentary with Dan Snow this week, it will be a Somme-themed week on Great War Photos. This image shows a group of men from a Divisional Signal Company of the Royal Engineers. There was no Royal Signals in WW1 and signalling work was done at battalion level by infantry signallers and for larger formations by the REs. 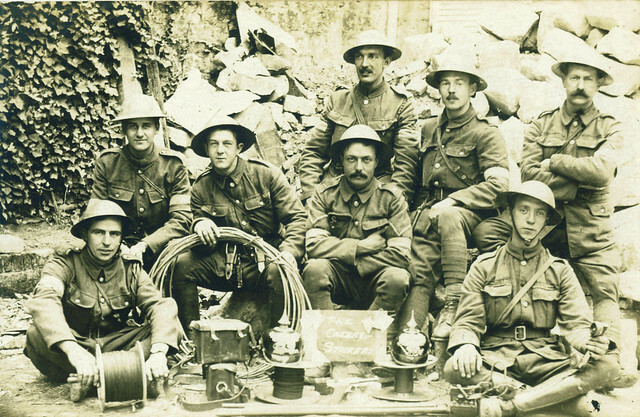 Photographed amid the ruins of a typical Somme building – possibly a church or town hall by the large chalk blocks – these men have all the kit they need to carry out their signalling work. Rolls of cable allowed field telephone to be connected; some men have the tools needed to cut and trim the cable; examples of field telephones in their leather bags can be seen and the man on the front right holds an example of a British phone in his hand. Signallers wore a white and blue armband and although it is not clear on every man in this image, the armband is being worn here. The men have obviously recently been in action and some trophies of war can be seen amongst their kit; two German Picklehaubes are visible, as is an example of a German Luger. The meaning of the caption on the board – ‘The Cherry Stickers’ – sadly appears to be lost in time. This entry was posted on 26/02/2012 by sommecourt. It was filed under British Army, France, Somme, Western Front, WW1 and was tagged with 1916, Picardy, Royal Engineers, Signallers, Signals, Somme. My Great granddad was with 40th signal coy Royal Engineers, I’m trying to find any info possible about him. Have you looked him up on Ancestry? The RE Museum at Chatham may be able to help, too.